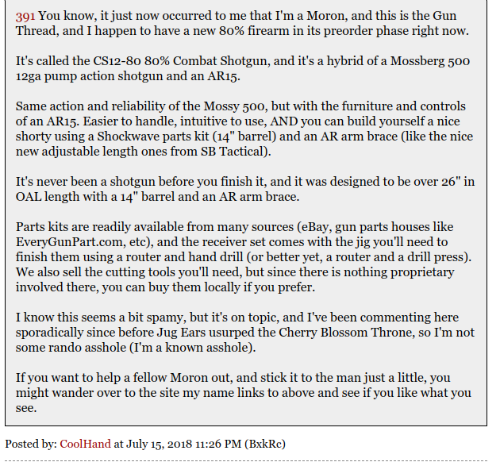 From last week's 'Weekend Gun Thread'. So, you handy DIYers. Let us know if you purchase this firearm and let us know if you build it. Heck take photos and/or videos and show us your finished product. Personally, I wish I was more handy. A review of a biometric gun safe. OK Horde, who has one and what do you think of it? I'm old fashioned, when I had guns before the great canoe debacle, mine were scattered about the home. On a related note, half-way around the world. All eyes should be on South Africa. Gun fight during high speed pursuit. Do you have something you wish to share? Perhaps a box or five of .38 Special ammo, maybe a brick of .22LR or some stories or tips? You can reach us at petmorons at gmail dot com.